These blisters significantly alter treatment, making it difficult to splint or cast and often overlying ideal surgical incision sites. Review of the literature reveals no consensus on management; however, most authors agree on early treatment prior to blister formation or delay until blister resolution before attempting surgical correction or stabilization. Fracture blisters are relatively uncommon, occurring in about 2.9% of all acute fractures requiring hospitalization.1 These blisters alter the management and definitive repair significantly; however, there is still no consensus on the timing of surgery nor the treatment of the blisters themselves. Here, we present a case report and review of the published literature with an aim to provide a consensus on the management of fracture blisters. We will also illustrate the risk factors, recognition and early management/treatment strategies that would be most helpful for the emergency physician. A 63-year-old male presented to the emergency department (ED) via emergency medical service after slipping on ice and twisting his left ankle. He denied any other injuries. He has a past history of hypertension, tobacco and alcohol use. Vital signs were temperature, 98.7°F; blood pressure, 200/93mmHg; pulse, 83 beats/min; respiratory rate 14 breaths/min; SpO2, 96% room air. Physical exam revealed no evidence of injury other than swelling and tenderness to palpation over the left lateral ankle. Radiograph showed a non-displaced left fibular fracture, which was stabilized in a posterior splint in the ED. The patient was advised on non-weightbearing status and follow up with orthopedics in one week. The patient presented two days later complaining of blisters bulging from his splint. He did admit to walking on his splint to get back and forth to the bathroom, but said that he thought it was only a sprain. Physical exam revealed interval formation of large, palm-sized, mixed clear and hemorrhagic blisters along the anterior distal mid calf to the medial and dorsal aspects of the left foot (Figure 1 and​ 2). The patient was admitted for blister care and forced non-weightbearing status. His splint was removed completely, and the foot was elevated and immobilized with strict bed rest. He received anti-coagulation with Lovenox, pain control and hypertension treatment. The blisters were left intact and dressed with Aquacel and Bag Balm daily. Whirlpool treatments were also initiated for healing of the superficial skin once the blisters had spontaneously ruptured. When the blisters had resolved, a cast was placed for definitive fracture stabilization. The fracture healed subsequently without complication. Risk factors for development of fracture blisters include anatomical sites with thinner skin without the underlying protection of muscle or adipose (ankle, wrist, elbow, foot, and distal tibia) and any conditions that predispose to poor wound healing, such as peripheral vascular disease, collagen vascular disease, hypertension, smoking, alcoholism, diabetes mellitus, and lymphatic obstruction. High energy injury, such as falls of an average of 18 feet, motor vehicle accidents, pedestrian vs. motor vehicle accidents and grade I and II open tibia fractures also predispose to fracture blister formation. 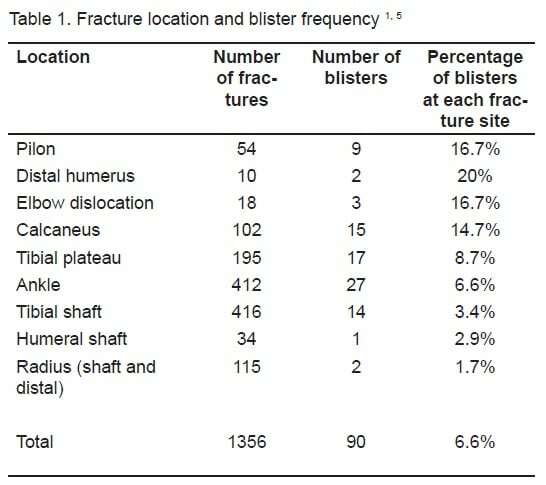 Studies by Varela1 and Strauss5 provide detailed data regarding fracture blisters based on location, the results of which are compiled in Table 1. 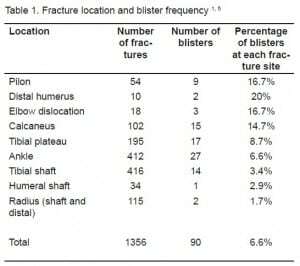 Varela1 conducted a three and a half year study characterizing all fracture blisters presenting to four different hospitals in a major metropolitan area from 1986 –1989. Strauss conducted a similar four year study at a major Level 1 trauma center from 1999–2003. Two types of fracture blisters are commonly seen: clear fluid-filled and hemorrhagic blisters. Hemorrhagic blisters represent a more severe injury where the dermis is completely stripped of epidermal cells, taking approximately 16 days to heal. The clear fluid-filled blisters have minimal injury to the dermis with some epidermal cells remaining attached, healing in approximately 12 days. The frequency of these types of blisters, based on whether clear or liquid, is noted in Table 2. While consensus among these authors has not been reached, it is clear that the presence of fracture blisters complicates and delays definitive repair. These blisters, and the skin breakdown associated with them, may result in chronic ulcers, infection and prolonged hospital stays. A study by Strauss5illustrates these complications further (Table 3). In a population with these risk factors, identification and early treatment is crucial to preventing these poor outcomes. Fracture blisters are an uncommon occurrence in patients suffering acute fractures, occurring in anatomical sites where the skin adheres tightly with little soft tissue between the skin and underlying bone. Localized tissue hypoxia and cleavage injury are the main mechanisms at work, and the injury resembles the changes consistent with a second-degree burn rather than a friction blister. Blisters are likely best left intact to preserve the sterile environment. If possible, early surgical intervention should be accomplished to prevent blister formation, but if already present, blisters should be allowed to resolve prior to surgery. However, in our review of the published literature, no conclusive data on any treatment strategy was presented. This represents an area of need for further research. It is important for the emergency physician to recognize those patients and fractures at particular risk of developing fracture blisters (i.e. those of the ankle, wrist and elbow) and if discharging, to give the patient warning signs/instructions to return, should these develop. In patients with comorbidities and impaired tissue healing, one should arrange for close follow up and admission should the fracture blisters develop. 1. Varela C, Vaughan TK, Carr J, et al. Fracture Blisters: Clinical and Pathologic Aspects. J of Orthopedic Trauma. 1993;7(5):417–27. 2. Giordano C, Scott D, Koval K, et al. Fracture Blister Formation: A Laboratory Study. J of Trauma-Injury, Infection, and Critical Care. 1995 Jun;38(6):907–9. 3. Giordano C, Koval K, Zuckerman J, et al. Fracture Blisters. Clinical Orthopedics and Related Research. 1994;307:214–21. 4. McCann S, Gruen G. Fracture Blisters: A Review of the Literature. Dermatology Nursing. 1997 Dec;9(6):391–7. 5. Strauss E, Petrucelli G, Bong M, Koval K, Egol K. Blisters Associated with Lower Extremity Fracture: Results of a Prospective Treatment Protocol. J of Orthopedic Trauma. 2006 Oct;20(9):618–622. 6. Giordano C, Koval K. Treatment of Fracture Blisters: A Prospective Study of 53 Cases. J of Orthopedic Trauma. 1995;9(2):171–6. 7. Wallace GF, Sullivan J. Fracture Blisters. Clin Podiatric Med Surg. 1995;12(4):801–12.